I'm using Microsoft Office Pro Plus 2016. I have a table (ListObject) which is a Sharepoint linked table and a custom UserForm which has 4 comboboxes within it (Region, Country, IMType and LOB). 1) I get an "Object Variable or With block variable not set" message and the form initiatlizes with this bit of code. Any reason why? Sheets("MIM Policy Governance Tracking").Range("AJ7").Value = ""
Sheets("MIM Policy Governance Tracking").Range("AK7").Value = ""
Sheets("MIM Policy Governance Tracking").Range("AL7").Value = ""
Sheets("MIM Policy Governance Tracking").Range("AM7").Value = ""
In short, I wondered if you could please review what i'm trying to do (ie perform an advanced filter on my listobject table based on the comboboxes criteria, and advise where i'm missing a trick as I've been at this for 2 days and seem to be going around in circles. Your help would be much appreciated, Merry Christmas all. So I managed to play around with the code and since doing so, I@ve been able to fix the issue I was experiencing so wanted to post my updated code here. Thanks to Imran for his comment about the UserForm error I had. This seems to have resolved my issue. If however, anyone out there can spot a better way of doing this, I'd be open to suggestions. I'm only a part-time dabbler in VBA so would welcome a guru's input here. Hope this can help others. Not the answer you're looking for? 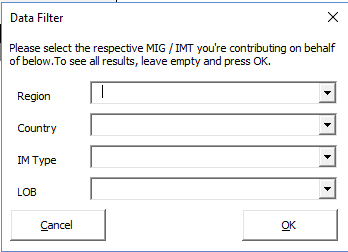 Browse other questions tagged excel vba userform autofilter or ask your own question. VBA is it possible to pass a Dictionary/Collection to an autofilter? How do I populate a combobox in a userform with each unique value from a range, sorted alphabetically?